(Jalak) Bali Starling population in Central Java reached 1500. This number exceeds the total population in its natural habitat in Bali, only amounted to 200 individuals. Because of the ease of licensing to be one major factor is the development of bird species in Central Java. The local government provides ease of licensing captivity. So that the population in Central Java Bali starling more, although only in captivity. Breeders and breeding of (Jalak) Bali Starling in Central Java felt calm, because the birds that they tangkarkan and develop official or legal status of the government, because of the ease in the permitting process captivity. So (Jalak) Bali Starling can develop faster and breeding can be done en masse. This will have a positive impact on the population of the endangered (Jalak) Bali Starling. Of the 111 protected bird breeding unit which is already registered in Central Java, a breeding unit 88 Bali Starling. 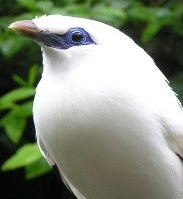 Solo Raya region has the highest number of captive (Jalak) Bali Starling, especially in the district of Klaten. While Solo only one breeding Bali Starling. Bali starling population increases in Central Java because of the ease of licensing and breeding. People are also interested in this bird species due to higher selling prices. Residents in Central Java, hoping for breeding and nurturing permission Bali Starling, which can reduce the illegal trade of the Bali Starling.